Watch Eagles vs. Packers tonight on 6abc! 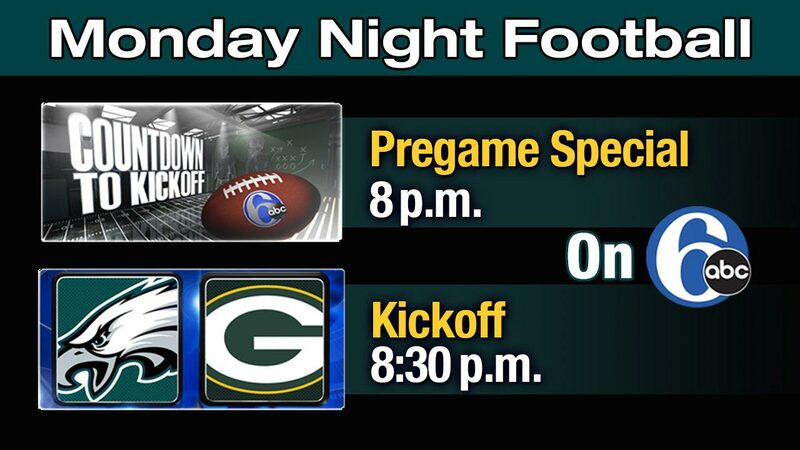 PHILADELPHIA (WPVI) -- The Eagles are gearing up for a Monday Night Football showdown against the Green Bay Packers. And you can watch the game TONIGHT on 6abc! Both teams need a win to avoid slipping further behind in the playoff race. The Eagles are 2-5 since a 3-0 start. The Packers have lost four straight games. Our coverage begins with a pre-game special, "Countdown to Kickoff," at 8 p.m.
Coverage of the game begins at 8:30 p.m.
Then stay with us after the game for a live post-game report.